Zurn Yacht Design revealed details of the new Vanquish 26 Dual Console. Vanquish Boats wanted Marblehead, Mass.-based Zurn Yacht Design to retain the narrow hull design for its new 26 Dual Console. Photo by Billy Black. 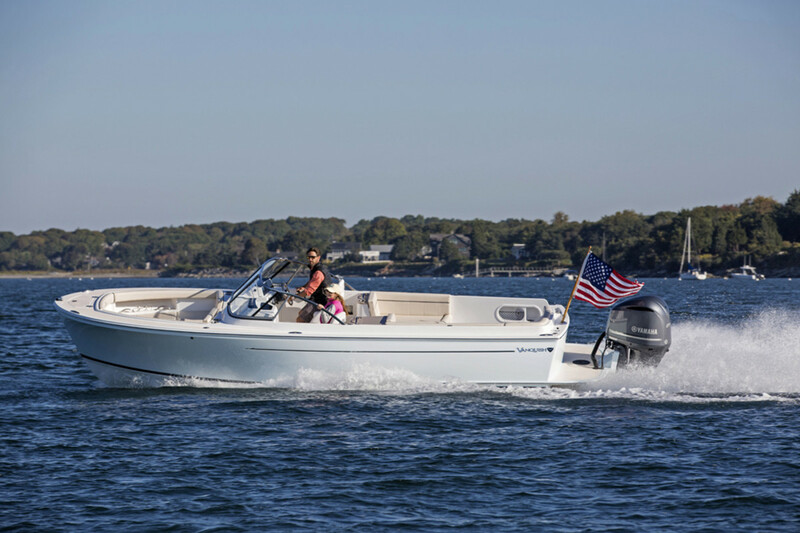 Based in Newport, R.I., Vanquish Boats has utilized Doug Zurn’s bow-forward design. Vanquish direct-drive inboard models are offered in gas or diesel power, and their hull is equipped with a unique propeller and shaft pocket that provides a 22-inch draft. An integrated wet bar is offered, with the customer’s choice of a sink or barbecue grill, and there is an enclosed head under the port console. The 26 is the first outboard model in the Vanquish lineup, which includes a 24-foot center console and runabout and a 26-foot center console. The outboard setup made more sense because an inboard’s engine box would deprive the boat of deck space, the company said. Vanquish wanted Zurn to retain the narrow hull design in other Vanquish models.